Contact lenses are a popular option among many of our patients. The optometrists and staff at Family Vision Center are here to help each patient find the right lens for their lifestyle and needs. Our goal is to provide maximum comfort and optimal vision with each contact lens fitting. Our doctors will work with you to determine which type of contact lens will be right for you and your lifestyle. We do so by fitting patients in trial lenses until they find a lens that works for them. Family Vision Center is proud to offer contacts at competitive rates. Contact lenses can easily be purchased 24/7 through our online outlet, www.Famvision.com, with savings up to 50% off retail prices. Contacts purchased in large quantities offer the biggest discounts. For more information on contact lenses click here. Family Vision Center is pleased to provide the prescription and colored contact lenses you need in Stratford and Bridgeport and the surrounding CT areas. 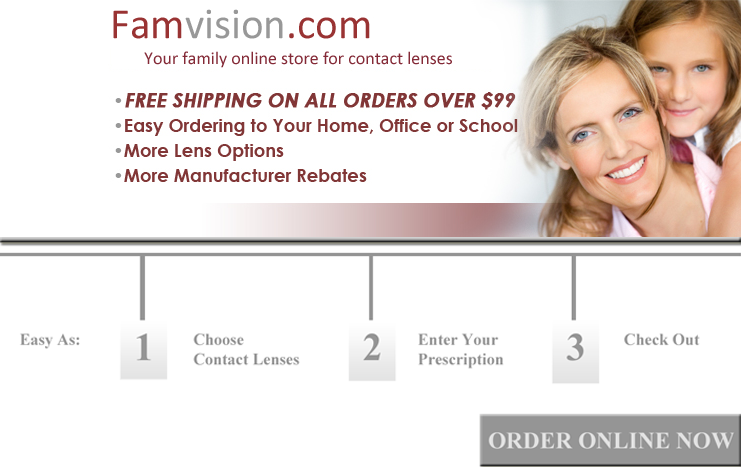 To purchase contact lenses, visit our online store at www.Famvision.com and enjoy significant savings off of retail prices! We look forward to serving all of your eye care needs.